Debt compromise agreement is a formal written agreement between a lender and borrower for final settlement of the debt with a compromise on interest or principle payable. The debt compromise agreement details the amount of original borrowing and interest rate, the amount payable and the acceptance of the compromise on behalf of the lender and the final settlement amount. You can also download the Debt Compromise Agreement format in the following formats. This debt compromise agreement format can be used by a lender or borrower for the purpose of settling the final dues where some compromise on the interest or principle due has been intimated and mutually agreed upon. Banks and financial institution would have their own format for debt compromise agreement vetted by in-house Lawyers. This debt compromise agreement can be used for settling due owed to private persons. Debt compromise agreement has legal force over and against the debt obligation that was initially contracted. 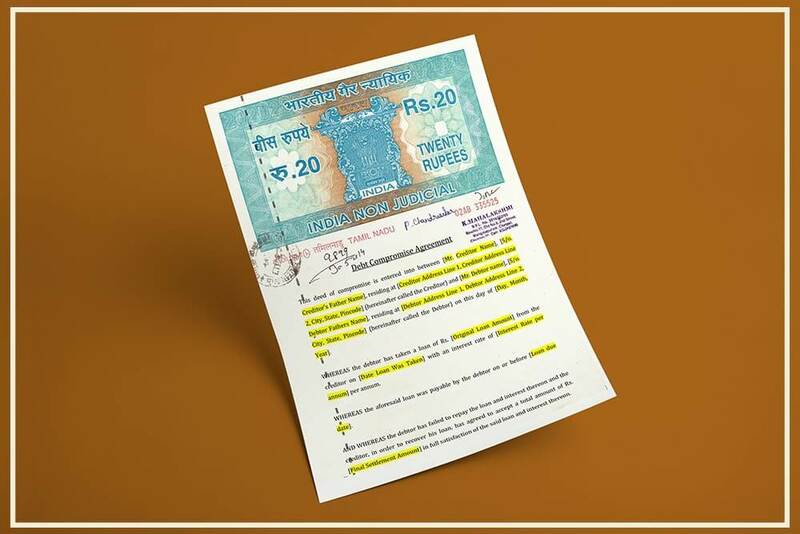 The debt compromise agreement must be printed on a Non-Judicial Stamp Paper with a value of Rs.10/- or more. 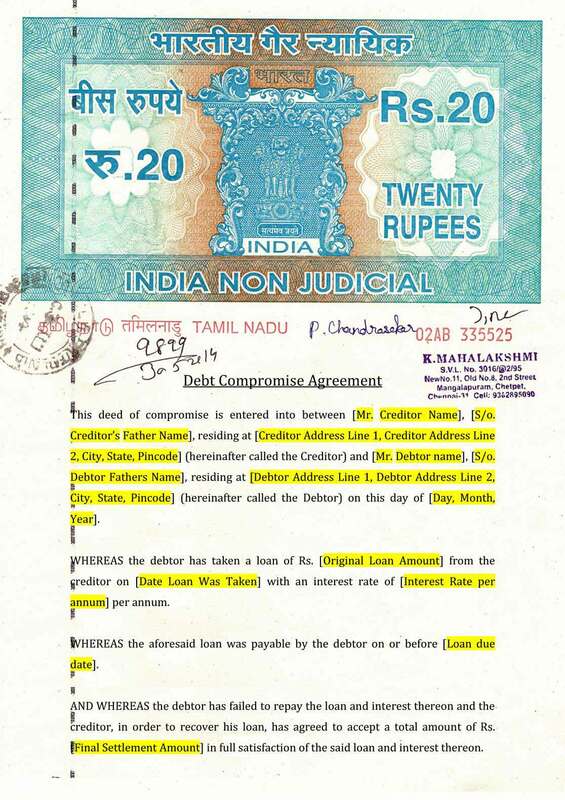 The debt compromise agreement is made in two copies and the lender and borrower each hold one copy of the original signed agreement for their records. One time settlement (OTS) offer for a loan is a scheme offered by banks and financial institutions to borrowers having genuine difficulties in making payments as per loan terms and conditions. While providing an offer to settle under OTS scheme, banks will offer a short time period within which the borrower can pay a reduced amount for the loan, the balance or difference would then be written-off by the bank. After completion of a debt compromise or one time settlement offer, the borrower is no longer approached by the Bank for payment. However, whenever the bank or financial institution enters into a debt compromise, the transaction is reported to CIBIL and the loan would show as written-off or settled. Such a marking on the CIBIL report is then viewed by other lenders as a sign of caution or negative behaviour. Also, when a loan is settled, the CIBIL score could be lowered by 75-100 points. Since CIBIL score is calculated based on 7 years of records of the borrower, the borrower could have significant difficulty in raising debt funds again. Hence, its important for all borrowers to consider the CIBIL impact when entering into a debt compromise or one time settlement agreement with a lender.